(1) Sericulture Inspector, (2) Farm Manager, (3) Assistant Superintendent of Sericulture, (4) Cocoon Marketing Inspector, (5) Grainage Manager, (6) Investigator, (7) Reeling Expert, (8) Reeling Foreman, (9) Senior Sericulture Instructor, (10) Reeling and Spinning Supervisor) under the Directorate of Sericulture, Assam, Khanapara, Guwahati-22. Pay: Pay Band-2, Rs. 14,000/- 49,000/- + Grade Pay Rs. 8700/- pm plus other allowances as admissible under the Rules. Educational Qualification: M.Sc. in Botany /Zoology with Post Graduate Diploma in Sericulture or M.Sc. in Sericulture/ M.Sc. in Sericulture Technology. Age : The age of the candidates should not be more than 43 years of age as on 01-01-2017. For SC/ST and ST(H) candidates the upper age limit will be relaxed by 5 years as per OM issued by Personnel (B) Department vide No. ABP 06/2016/04 dated 3rd March, 2016. Candidates should submit self attested copy of all testimonials from HSLC onwards with 2 (two) passport size photograph along with the application without which the application will be rejected. How to apply: Candidates should submit self attested copy of all testimonials from HSLC onwards with 2 (two) passport size photograph along with the application. The application must be submitted at the latest 29-08-2017 by the competitor physically to receive the acknowledgement receipt from this office. 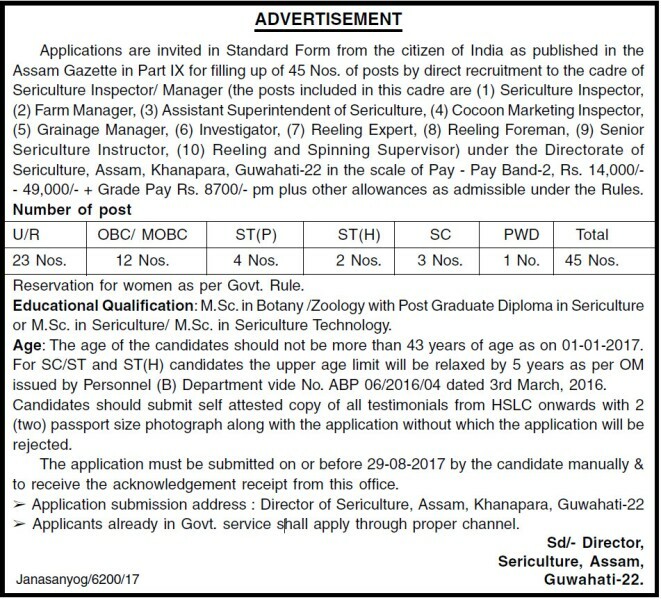 Application submission address : Director of Sericulture, Assam, Khanapara, Guwahati-22.